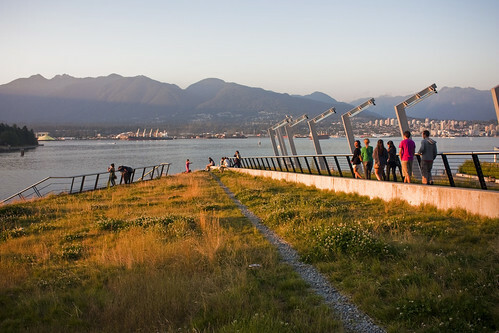 Maisonneuve | Arthur Erickson and the Failure of "Vancouverism"
Arthur Erickson and the Failure of "Vancouverism"
It comes to me whenever I am in Vancouver: an urge to watch the sunset. Pulled by memories of blue Pacific waters buffeting a tangerine sky, I make my way to English Bay Beach, where I find a seat on one of the large pieces of driftwood that have been arranged on the sand, and join hundreds of others in the nightly spectacle. Last month, though, on my final day in Canada, I was taken to watch the sunset from the roof of the new Vancouver Convention Centre, a sharply geometric structure that rises from a broad concrete plaza next to Coal Harbour. As I climbed the metal staircase up to the roof, I was sceptical that it would be anything close to the English Bay experience. When we arrived, I was surprised. Built at a slight angle, covered in wild grass, with a gravel path cutting diagonally across it, the roof feels like a country meadow that has somehow found itself three stories above ground. Watching the sun set from there, over the water of Coal Harbour and the tall fir trees of Stanley Park, was a surprisingly bucolic experience. On the surface, that sounds reminiscent to other recent experiments in aerial urban greenery, like New York’s wildly popular High Line. But the convention centre’s roof has more local roots. In many ways, it is the latest product of a style of urbanism born in 1978, when Arthur Erickson designed Robson Square, a large civic centre in downtown Vancouver that combined provincial law courts, a municipal art gallery, government offices and a series of public spaces. Erickson placed the law courts in a terraced building at the south end of the site and covered them with greenery. At the other end was the old neo-classical courthouse, which was turned into the Vancouver Art Gallery. In between, adjacent to busy Robson Street, were gardens, fountains and a sunken plaza home to an ice rink. Government offices and an underground passage connected the two sides of the site. Throughout the square, Erickson made characteristic use of poured concrete and plenty of local vegetation. The green and grey palette mirrored that of Vancouver’s natural environment. This was the building-as-landscape; British Columbia’s natural features reimagined as a city square. It was hugely influential. For the next thirty years, Vancouver took Erickson’s ideas to heart, so much so that it spawned an entire movement of urban planning that came to be known as Vancouverism. “Vancouverism is characterized by tall, but widely separated, slender towers interspersed with low-rise buildings, public spaces, small parks and pedestrian-friendly streetscapes and facades to minimize the impact of a high-density population,” wrote the New York Times’ Lisa Chamberlain in 2005. 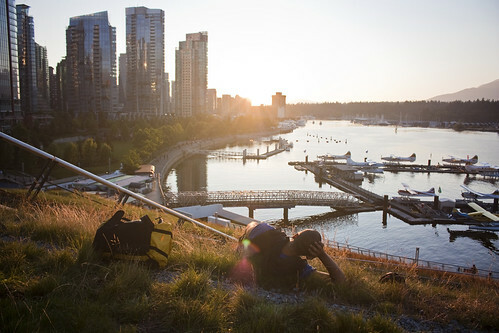 The problem with Vancouverism, or at least the form it has taken in its place of birth, is that the city it produces doesn’t feel much like a city. 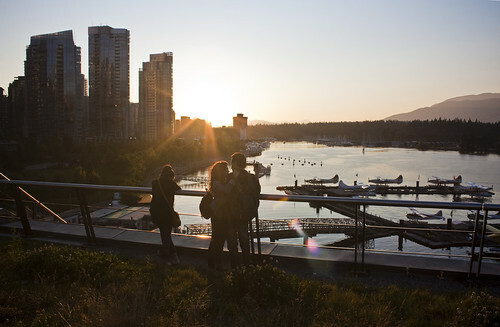 The Vancouver neighbourhoods mostly heavily guided by its principles — Yaletown and Coal Harbour, most notably — have a contrived quality, and I’m almost certain it doesn’t come from the fact that these neighbourhoods are relatively new. It has to do with the scale, which is awkward — Vancouver’s three-storey townhouses and thirty-storey towers have neither the harmony of Haussmanian Paris nor the intimacy of backstreet Tokyo. I’m also ambivalent about the way nature is dealt with in Erickson’s buildings, and by extension those of Vancouver as a whole. Too often, it feels tacked on, as is the case with Robson Square; a few fountains and juniper bushes do not a temperate rainforest make. The terraced nature of the site, with all of its concrete steps and hidden alcoves, only emphasizes the tension between the blatantly artificial and ostensibly natural. But this probably has more to do more with the limitations of 1970s-era green-building technology than with Erickson’s intent. That’s why the convention centre feels more like an evolution than a departure from the past. It’s like Robson Square but more carefree. After all, grass isn’t grass until you can feel it beneath your feet.